THE DEATH AND LIFE OF MARSHA P JOHNSON is complex film. 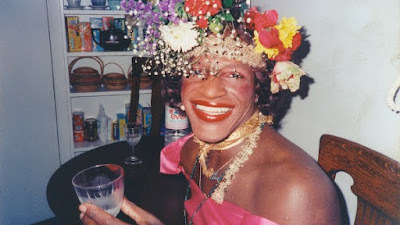 Nominally the story of Miss Johnson, her life and death, the film actually casts it's film wider and takes in the story of Johnson's compatriot Sylvia Rivera as well as the struggle for transgender rights and respect even within the LGBT community. The story of Miss Johnson is framed by the investigation of Victoria Cruz from the New York City Lesbian and Gay Anti-Violence Project. Cruz knows that most crimes against transgender women go unsolved or unpunished and she would like to determine what happened to Johnson who was one of the driving forces of the Gay and Trans Rights movement. Cruz is very much aware that looking into a death 25 years after the fact is going to be difficult but she hopes that someone or some piece of information will come to light. Based on the write up in the Tribeca press material I thought I was going to be a true crime murder mystery focusing wholly on Miss Johnson. I didn't expect a film that laid bare the history of not only the history of Gay Rights but also the history of Trans Rights. What I thought was going to be a straight forward tale became a rich layered story that is going to require several more viewings in order to truly fully process everything that the film as telling us. Quite simply there is a lot of history in this story that most people are simply not going to be aware of. I am not certain what to say about the film other than this film demands to be seen. This is a heady and frequently moving mix this is a film which needs to be seen about a battle that is still being fought. If you need further proof of the struggle still being fought consider that as the film was premiering at Tribeca Chay Reed was killed in Miami.